Special days require special treats! Who doesn’t go to the best bakery in town to buy a big, luscious cake to celebrate the birthday of a loved one? Lately during our usual post-dinner conversations (they go more or less like this “I feel like having something sweet”, “uhm, chocolate?”, “how about ice cream?”, “what kind of ice cream do we have?”…) the hubby kept saying he wanted Profiteroles. Probably because he can’t have profiteroles in Berlin! 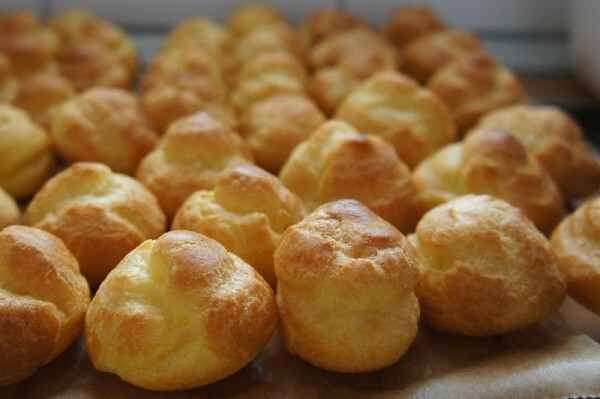 There are many types of Profiteroles in the world but the one the hubby wants is an italian cake that you usually buy in a pastry shop, very few would try to make it at home. It is lengthy and not easy (not hard either, but it requires a bit of practice). 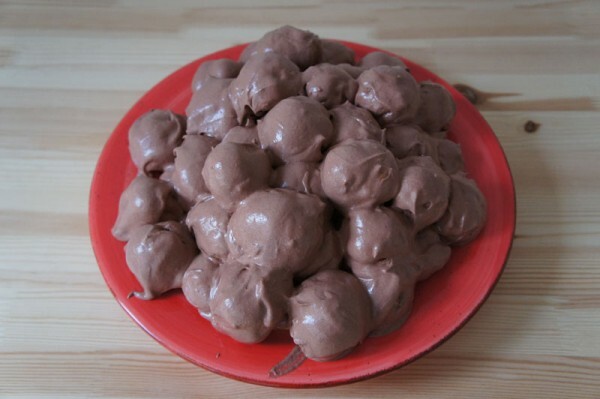 I made Profiteroles ones in the US, a couple of years ago. Again, couldn’t find it, had to try to make it! It was good, and looked great, but afterwards I had a long list of tipps for the next time and notes on unsatisfactory details. With such a special occasion coming up and the continuous hint from the hubby I had to give it another try! The result? I hope the pics talk for themselves because I am speechless! It turned out absolutely amazing, almost like the ones from the pastry shop. The only problem? It will be gone in no time and it took forever to make (some 3 hours beginning to the end). 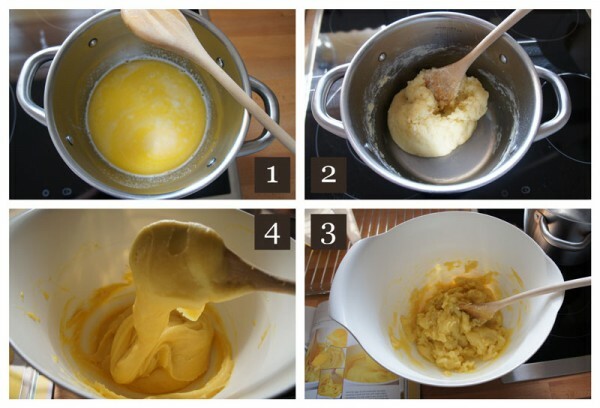 The recipe for the choux pastry, the pastry cream and the chantilly cream comes from the (amazing) book Pastry -Savory and Sweet- by Michel Roux. The recipe for the profiteroles dough is my own. First a general description: this cake is made of puffs, choux pastry balls, filled with pastry cream (or chantilly cream), coated in chocolate mousse and placed in a dish to form a pyramid. 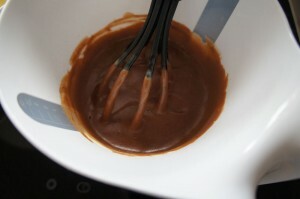 Where each mousse coated puff joins the next one you can pipe a tuft of cream. I didn’t add extra cream, I thought this profiteroles had enough calories on its own :P Often profiterols recipes call for a chocolate ganache frosting but my grandpa (the pastry chef) used to make it with this soft fluffy delicious chocolate layer rater than with something that will harden in the fridge. 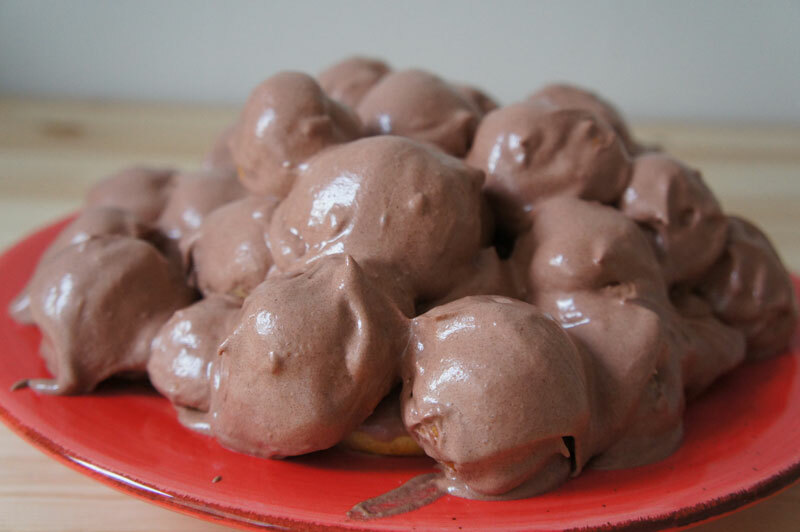 So I coated the puffs in chocolate mousse. The result was outstanding! I used a store bought chocolate mousse for simplicity. 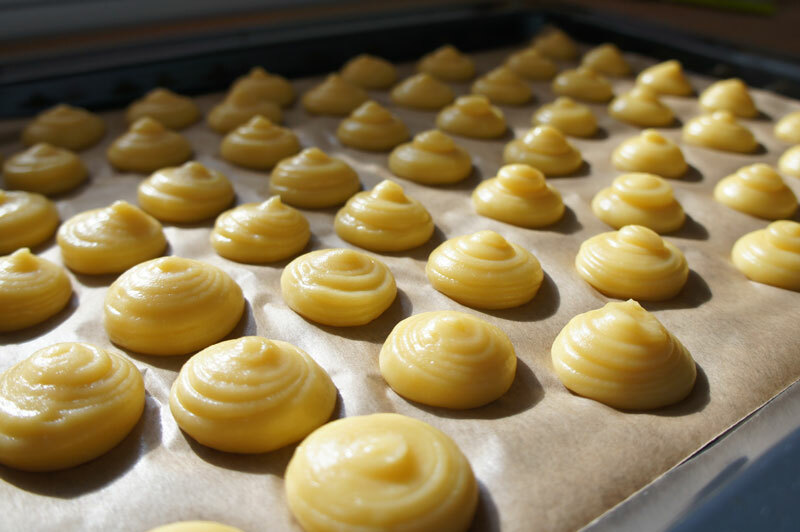 Start by preparing the pastry cream since it needs to cool before you can use it to fill the puffs. Beat the egg yolks with the rest of the sugar (40 gr) until light and fluffy (picture 1). Add the flour and combine well. Pour the milk, the vanilla bean (scored lengthwise, or vanilla flavor), and 2/3 of the sugar (85 gr) in a pot and set on the stove at medium heat. As soon as the milk comes to a boil pour it slowly into the egg yolk mixture and stir well. Pour back into the pot and set back on the stove. Bring to a boil (picture 2) and let boil for 2-3 minutes, stirring constantly, until it thickens. Transfer to a bowl and let cool (picture 3). Save the egg whites for a soft walnut cake, or stay tuned to see what I made with this batch of egg whites. I decided to fill half of my choux pastry puffs with pastry cream and half with chocolate pastry cream. To make chocolate pastry cream you add chopped chocolate to the cream when it is still hot, and then you simply stir to melt the chocolate into the cream. While the chocolate filled puffs where outstanding eaten by themselves, once coated in chocolate mousse they were too chocolatey for me. I prefer a contrast of flavors. Next time I will fill half of my puffs with pastry cream and half with chantilly cream! Delicious!!! Preheat the oven to 180°C (350°F). 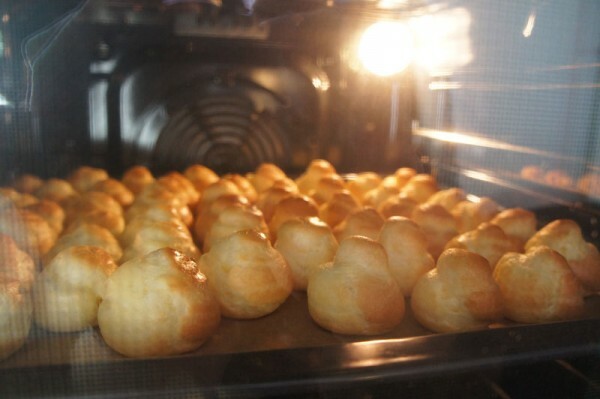 Ventilated ovens work best for choux pastry but regular ovens work too with no problem. Pour water, milk and butter (cut in chunks), salt and sugar in a pot. Put on the stove on medium high heat (picture 1). As soon as it starts to boil remove from the heat, add the flour and stir with a wooden spoon until incorporated. Bring back to the stove and cook for a couple of minutes stirring and braking the mass in chunks (picture 2). The dough needs to dry, loose some of its humidity. Remove from the stove and tip into a bowl. Add one egg at a time and stir to incorporate (picture 3) before adding the next one. When the fourth egg is well incorporated a thick ribbon should fall off the spoon (picture 4). Line a large metal pan with parchment paper. Fill a pastry bag, fitted with a 1 cm flat tip, with the choux pastry, and form small mounds of about 3 cm in diameters. Try to use the same amount of dough for all of them so they will cook evenly and will be all the same size (I failed ;). Don’t pipe them too close to each other, they will double in size in the oven. If they have a pointy tip on top, wet your fingers and press it down. This is firstly because you are aiming for round puffs, and secondly because the pointy top will burn long before the puffs are ready. Transfer to the oven and bake for 15-20 minutes. I left mine close to 20 minutes. Once they are ready, that is when they have popped high and are nicely tanned, turn off the oven. Open the door just slightly, an abrupt change of temperature will flop them (been there, done that ;) After some time open the oven door all the way but wait some more before you take them out. Tip on a cooling rack. Wait until the puffs have reached room temperature and are easily manageable. Fit a pastry bag with a small pointy star tip and make sure you can easily poke a hole through the puffs with the tip. 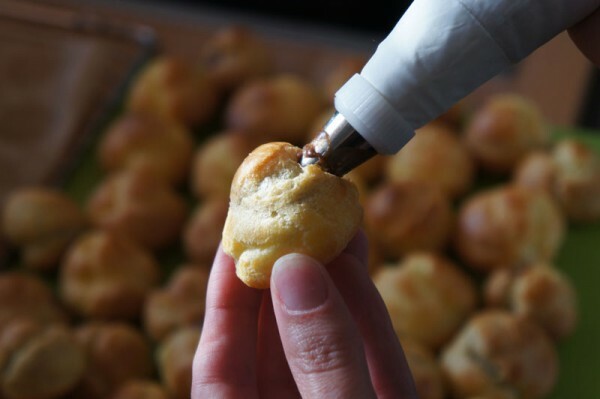 If you can’t, use a pointy knife and cut a small hole (on the base or the side) of each puff. Fill the pastry bag with the chilled pastry cream or chantilly cream and start to fill the puffs. Given the extreme sweetness of the filling of the puffs I would suggest you (and myself for the next time) to use dark chocolate mousse. The contrasting flavor will highlight the sweetness of the puffs. Prepare the mousse as per directions on the package but don’t chill it. 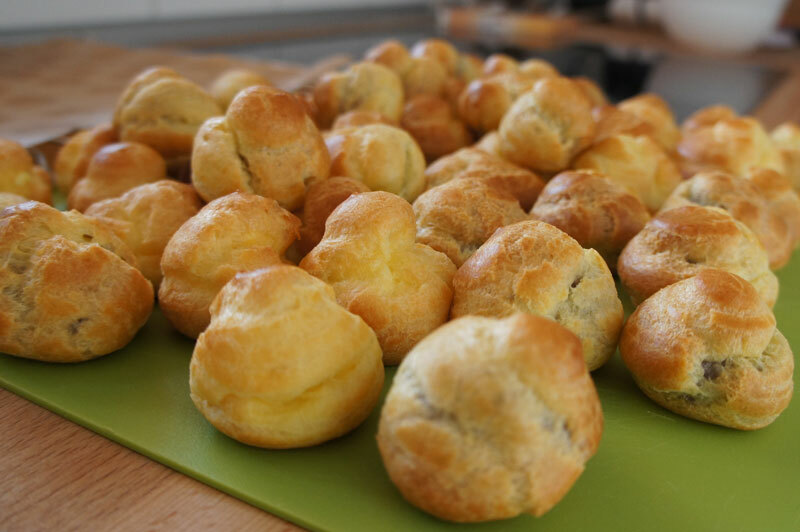 Choux pastry puffs can last for a long time in the freezer, so don’t through away the leftovers. When ready to use just spread them out on a plate at room temperature and wait some 30-45 minutes before using them. Oh I used to love those. Look delicious! You used to… :( See, I can’t do it! Thank you for stopping by!